The 2015 regular season ended with a 4-12 record for the Chargers. The last time San Diego made the NFL playoffs was 2013. 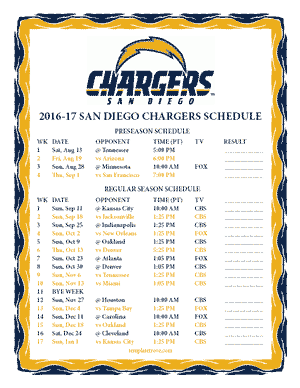 The Chargers compete in the AFC West with the Denver Broncos, Kansas City Chiefs and the Oakland Raiders. San Diego will not make an appearance on Monday Night this season, but will play on Thursday Night in primetime, week 6 when they host the defending champion Broncos.